The bulk freighter D.M. Wilson in 1873. Beneath the boiler ash pan looking towards the engine room. Description: The D.M. Wilson was headed for Milwaukee with a load of coal when it sprang a leak and began sinking. The steamers Hudson and Samuel Mitchell took it in tow, but it foundered in 40 feet of water two miles north of Thunder Bay Island. The crew was rescued by a fourth ship. The Wilson was broken up by a gale 10 days later, when debris was driven as far south as Tawas. Much of the machinery was later salvaged. Most of the Wilson's hull remains intact today, including a large windlass that rests on the bow. Link to historical Information on this ship. 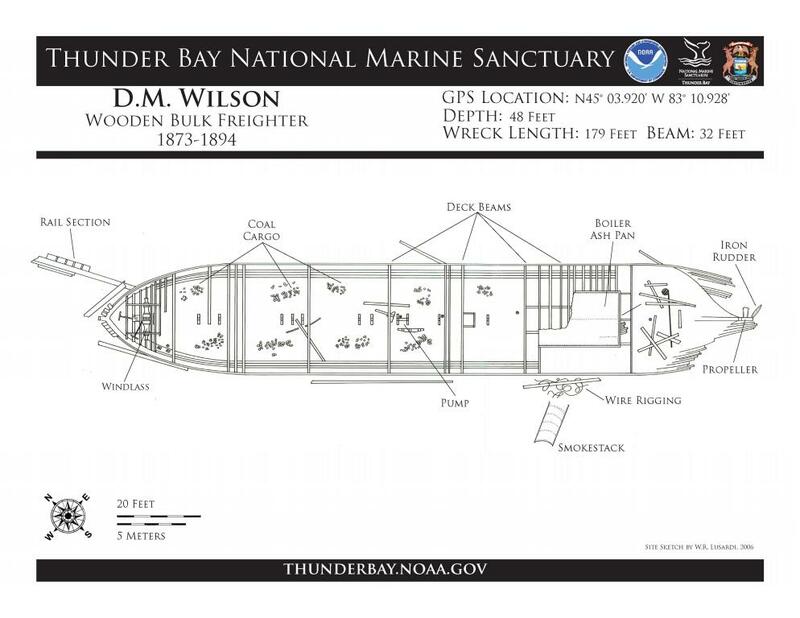 Thunder Bay National Marine Sanctuary: Enjoy diving the wrecks of Thunder Bay, but always respect the past. State and federal laws prohibit removing or disturbing artifacts. Future generations are depending on us to leave historic shipwrecks intact. Please take only pictures and leave only bubbles. The Thunder Bay National Marine Sanctuary maintains seasonal moorings at many shipwreck sites. Available from May to September, the moorings make for safer diving and also protect shipwrecks from anchor damage. Sanctuary regulations require vessels to use moorings when present.